BLOSSUM is a French limited liability company, with its registered office located at 190 avenue Franck de Peyronnet, Cailloux sur Fontaines (69270) in France, registered in the Lyon Trade and Companies Register under SIRET number 793 175 480 00011. BLOSSUM (the Seller) sells the Products (mostly accessories for smartphones that enable users –such as cyclists-to make full use their smart devices during cycling trips without worrying about the impact of rain, dust, or shock) to customers. 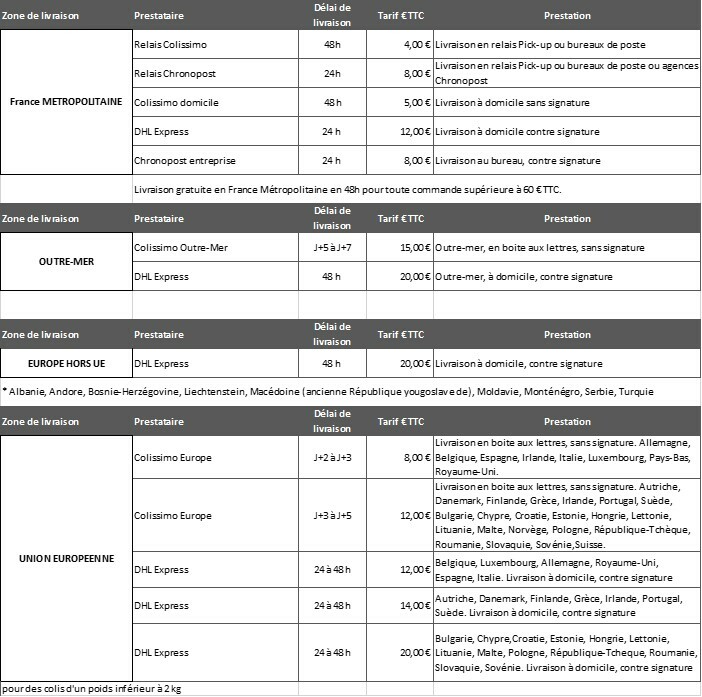 The following Terms of Sale (TOS), posted at www.tigrasporteurope.com, shall govern all use of the TIGRASPORTEUROPE platform and sales of Products through it, without any restriction or modification. This platform shall not be used for professional purposes. Purchasing the Products through the platform shall be reserved to persons qualified as “consommateur” (consumer) exclusively. Hereby Terms of Sale shall be considered as an English version of the Conditions Générales de Vente posted at www.tigrasporteurope.com The French version shall prevail at all times. BLOSSUM may amend these Terms of Sale from time to time, and without notice. Amendments to the Terms of Sale shall be effective immediately upon posting of the modified version on the platform. Customers therefore agree to review applicable Terms of Sale regularly to be aware of any amendment. Customers are informed of the features and description of the Products, its Price, terms of shipping, and date of receipt before ordering. Customers, by using the platform, confirm that they accept that hereby Terms of Sale –in addition to potential specific terms of sale- shall govern all use of TIGRASPORTEUROPE and order of Products on the platform, without any restriction or modification. Information and data registered by the platform shall be considered as truthful and serve as piece of evidence for all orders or use of the platform. If any provision of these TOS is declared by a court or competent jurisdiction to be invalid, illegal or unenforceable, such a provision shall be severed from the TOS and the other provisions shall remain in full force and effect. In such event, the parties shall replace the cancelled provision, to the extent permitted, with a valid provision that is in keeping with the spirit and purpose hereof. The Seller attempts to present the Products as accurately as possible, through visual representations or text description. However, if the Customer turns out to consider that the discrepancies between such representations and the Product paid for are too important, he shall remain free to exercise his right of withdrawal. - does not include any duties or tax other than French Value Added Tax. In particular, for countries out of European Union, shall any sum (other than French VAT) be due, it shall be borne exclusively, together with the responsibility of handling any applicable paperwork that may be needed, by Customer. Cost for telecommunications to access the platform shall be borne exclusively by the Customer. Payment of products is due immediately at the time of order. Customers can pay with banking cards. For Customers residing out of France, payment card shall be either CB, Mastercard or Visa. Any order requires prior agreement of hereby TOS, without any restriction or modification. BLOSSUM reserves the right to refuse any order. Orders can be shipped in the following countries: European Union, Switzerland. Orders are shipped pursuant to the information provided by Customer at the time of Order, at the address provided. Customer shall therefore make sure that the information provided to BLOSSUM is complete, appropriate and accurate. Customer remains fully and exclusively responsible of the accuracy of the delivery information provided. The Seller has the right to partial delivery of goods. - notify said damage by sending a copy of said reserves to the Seller immediately and no later than two days after the date of delivery, through registered letter with acknowledgment of receipt . - send a copy of this mail to the Seller through registered mail with acknowledgment of receipt. Aforementioned three days-delay is important for the Seller to hold the carrier liable. Pursuant to the terms of Article L121-1 and seq. of the Code de la consummation (French consumer code), the buyer, if he or she is a consumer, has the right to withdraw from the contract completed through the platform within 14 (fourteen) days of the receipt of goods. This right can be utilized only by consumers. Consumers have the right to withdraw without specifying a reason. - for Products that are liable to deteriorate or expire rapidly. For the purposes for exercising the right to withdraw from the contract, Customer must inform BLOSSUM at sophie@tigrasport.com or by mail at: BLOSSUM – Service Clients TIGRASPORT – 53 ZAC DE CROULOUP – ROUTE DE QUINCIEUX – 69380 CHASSELAY – FRANCE. Customer may use the template posted below. Use of the template is however not mandatory. Customer must return the Products within fourteen days of the information that (s)he exercises his(er) right of withdrawal. Customer only needs to send the request of withdrawal from the contract before the time period elapses. Customer must pay for the shipping costs related to the right of withdrawal. Customer must choose a shipping method that is consistent with the nature and character of the Product, including its functionality. BLOSSUM will return Customer’s payment, including initial delivery price, without undue delay, within fourteen days from the date of receipt of Customer’s request for withdrawal. Customer shall use the Products reasonably, in accordance with the indications provided by the manufacturer or the Seller. The Seller shall not liable if the Product has been used in a manner inconsistent with indications or its original purpose or under inappropriate circumstances. 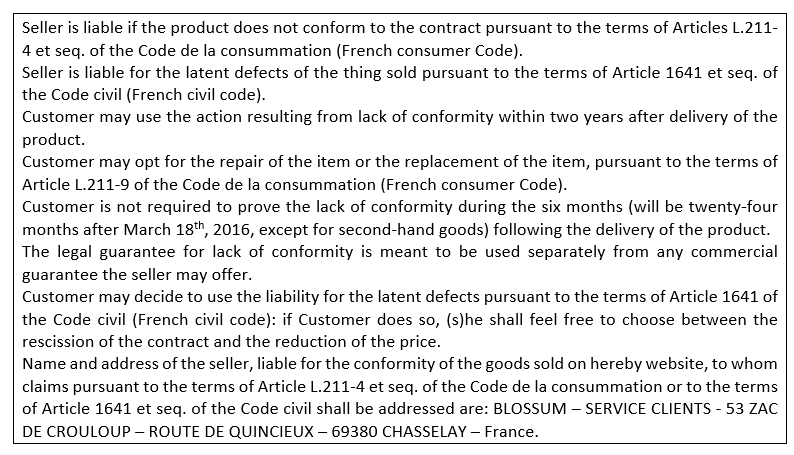 In accordance with Article L. 211-15 of the Code de la consommation (French consumer Code), BLOSSUM hereby draws your attention to the following provisions relating to the guarantee of Products. "The seller is required to deliver a product which conforms to the contract and is held liable for any lack of conformity existing upon delivery. "Action resulting from lack of conformity lapses two years after delivery of the product". "A seller is bound to a warranty on account of the latent defects of the thing sold which render it unfit for the use for which it was intended, or which so impair that use that the buyer would not have acquired it, or would only have paid a reduced price for it, had he known of them". "The action resulting from the defects giving rise to the right to cancellation must be brought by the buyer within a period of two years following the discovery of such defect". For further information concerning the action resulting from the defects, Customer may report to articles 1641 to 1649 of French civil Code. As far as public order allows it, BLOSSUM shall not be held liable for indirect damages. BLOSSUM’s liability (including contractual and tortious liability) shall in no event exceed the amount of the related Product at the date it was ordered. Complaints may be notified through our contact form posted at sophie@tigrasport.com or sent to BLOSSUM – Service Clients TIGRASPORT - 53 ZAC DE CROULOUP – ROUTE DE QUINCIEUX – 69380 CHASSELAY Cedex – France. BLOSSUM shall not be liable in case of Force majeure, i.e. situations (including but not limited to disaster and acts of God) under which it is very difficult for BLOSSUM, and beyond its reasonable control, to comply with its obligations under hereby sales agreement to provide services and any actions or omissions. You can exercise your right of withdrawal by sending the form below, indicating that you notify your withdrawal from this contract for the sale of the property or properties designated below. The use of this form is not mandatory, you can also send your withdrawal request by mail free. Reimbursement is made as soon as possible and no later than fourteen (14) days from the date Blossum is informed of your decision to withdraw, on the credit card used for payment.We remind you that the statutory withdrawal period is fourteen (14) days. Need more information about a product, about your order or else, you can contact us by visiting the section "Contact Us". If you encounter a problem with one of our products, use the section "Contact Us" also. - Select the subject of your application, the reference of the order and describe in detail the anomaly on the product. You can attach a photo to your description. - The Customer Service will respond within a period of 72 hours. If your application is accepted, the Customer Service will communicate the address to return the defective product. - No returns will be accepted without first contacting the Customer Service. - Upon receipt of the product, it will be analyzed by our Technical Service and decided to reimburse you, exchange or repair the product. You will receive a notification by email. - The repayment of your product will be triggered automatically. It will be effective within 14 days maximum after notification on the credit card used when ordering. - In case of an exchange, a new product will be sent within 14 days. - In case of repair, we will inform you about the deadline. - Shipping costs remain at the consumer's expense. The products are delivered to the shipping address that was specified in the order and according to the specified deadline. This delay does not include the order preparation. When the customer order multiple products at the same time, they will all come at once. In case of delayed shipment, Customer Service will inform you by email within 72 H. If the delay exceeds 14 days, you can cancel your order and we will issue a refund to the credit card used to pay the order. 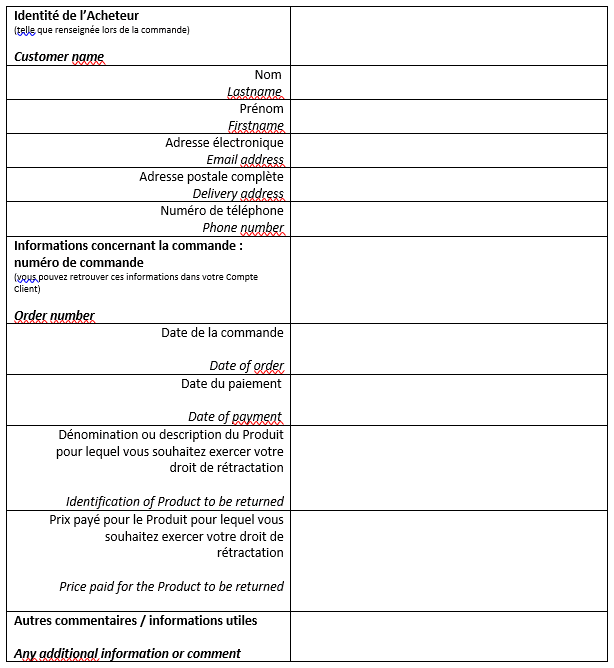 In case of delayed delivery, the customer has the option to terminate the contract in the terms and conditions laid down in Article L 138-2 of the French Consumption Code. Seller will then reimburse the costs of the product and "freight" in terms of Article L 138-3 of the French Consumption Code. Seller provides a mail contact specified in the order confirmation email to follow up the order. Seller reminds the consumer that when he takes physical possession of the goods, the risk of loss or damage to the goods are transferred to him. The Customer has to notify the carrier any reservations about the product delivered. Carriers : Below is a summary table of carriers, delivery time and cost. For shipments over 2 kg, you can directly contact Customer Service who will investigate the most appropriate transport solution according to destination. Orders will be processed within the limits of our available stocks and subject to availability at our suppliers. In case of unavailability of an article for a period exceeding 15 working days, you will be immediately notified predictable delivery times and order of this article may be canceled on request. The client can then request a credit for the amount of the item or refund. Le paiement sécurisé en ligne par carte bancaire est réalisé par notre prestataire de paiement, le Crédit Agricole via sa solution E-transactions. Les informations transmises sont chiffrées dans les règles de l’art et ne peuvent être lues au cours du transport sur le réseau. L’acheteur ajoute un ou plusieurs articles dans son panier, le valide et procède au paiement de sa commande. Après avoir saisi l’adresse et les modalités de livraison, il choisit l’un des moyens de paiement proposés. Il est dirigé vers la plateforme E-transactions qui affiche alors une page cryptée SSL (https). Une demande d’autorisation est envoyée vers les réseaux. Chaque paiement fait l’objet d’une demande d’autorisation systématique à la banque du porteur pour diminuer les risques d’impayés (solvabilité / carte en opposition). L’acheteur est ensuite redirigé vers le site e-commerce avec le résultat de son paiement (Accepté / Refusé / Annulé). S’il y a un problème sur un moyen de paiement, il vous sera possible de le rerouter vers la page de choix, pour en proposer un autre. Trademarks, domain names, products, software, images, videos, texts or generally any object of intellectual property rights information are and remain the exclusive property of the seller. No assignment of intellectual property rights is conducted through these Terms. Total or partial reproduction, modification or use of such property for any reason is strictly prohibited. We are the sole owners of the information collected on this site. We have access only to information that you have voluntarily provided to us via email or other direct contact from you. We do not sell or rent information collected to anyone. We use your data in order to answer you about the request you sent us. We do not share your data with third parties external to our company, other than that necessary to fulfill your request, eg to ship an order. Under the French Data Protection Act of 6 January 1978, you have the question to, access, modification, opposition and correction of personal data. By adhering to these terms and conditions, you consent to us collecting and using these data for the realization of this contract. By entering your email address on this website, you will receive emails containing information and promotional offers on products displayed on www.tigrasporteurope.com. You can unsubscribe at any time. You just have to click on the link at the end of our emails or contact the controller (the Blossum Society) by registered letter. We carry on this website track attendance. For this, we use tools such as Google Analytics.